Read and download the exhibition catalog here. SAT, FEB 16 | 12-2PM | Coffee & Conversation: Artists Sarah E. Brook, Qiana Mestrich, Gustavo Prado, and Levan Mindiashvili for a gallery tour and discussion of their work in the BRIC Biennial: Volume III. Coffee provided! 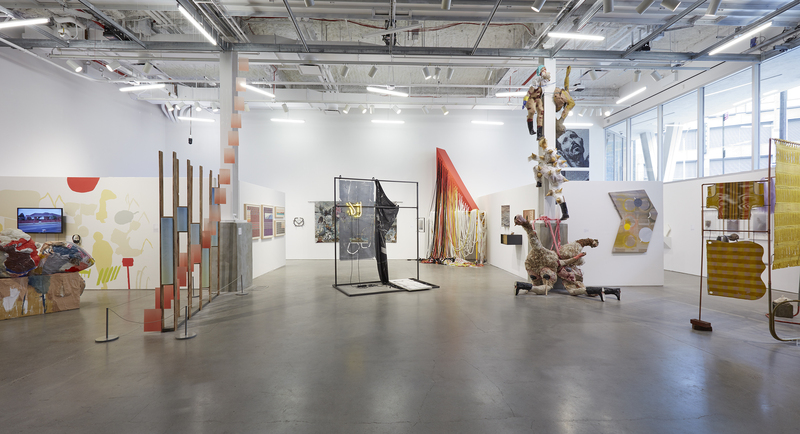 WED, MAR 13 | 7PM | Panel Discussion on Artist Opportunities: A conversation moderated by NURTUREart's Executive Director William Penrose, and including curators, arts administrators, and artists, on the opportunities, community, and process driving the current open call system for residencies, fellowships, and exhibition opportunities. An exhibition curated by Pricilla Dobler featuring work by Carmen Lizardo, Maureen McCourt, Lacey McKinney, Regina Ruff, Lesley Wamsley, Kelly Worman, LadyFIRM, Asia Tail, Hudson Valley Bee Habitat and Anida Yoeu Ali. An installation of donated personal items that represent lesbian and queer identity by Phoenix Lindsey-Hall. For information about participating visit lesbianmatters.com. Lead support for BRIC's Contemporary Art Program is generously provided by the Stavros Niarchos Foundation. Lead special 40th Anniversary support provided by Lambent Foundation. Additional support provided by Lily Auchincloss Foundation, Inc.
BRIC’s contemporary art program benefits from generous private funding from Alloy Development, Lily Auchincloss Foundation, Inc., Milton and Sally Avery Arts Foundation, B&H Photo Video, Bloomingdale’s, Brooklyn Navy Yard, Con Edison, Douglas Elliman Real Estate, The Educational Foundation of America, Ford Foundation, Goya, The Hearst Foundations, JP Morgan Chase, Lambent Foundation, M&T Bank, Stavros Niarchos Foundation, The Robert Lehman Foundation, the Oppenheim Family Fund, Scherman Foundation, TD Bank, Tiger Baron Foundation, and Pia and Jimmy Zankel, as well as numerous individual supporters. Generous public support is provided by the National Endowment for the Arts; New York State Council on the Arts with the support of Governor Andrew Cuomo and the New York State Legislature, and the Regional Economic Development Council; Mayor Bill de Blasio and the New York City Department of Cultural Affairs, Commissioner Tom Finkelpearl; New York State Assembly Member Jo Anne Simon; Brooklyn Borough President Eric Adams; New York City Council Speaker Corey Johnson, the Brooklyn Delegation of the New York City Council, New York City Council Majority Leader Laurie Cumbo, and New York City Council Members Alicka Ampry-Samuel, Inez Barron, Justin Brannon, Robert E. Cornegy, Jr., Rafael L. Espinal, Mathieu Eugene, Brad Lander, Stephen Levin, Darlene Mealy, Antonio Reynoso, Mark Treyger, and Jumaane Williams.